Bachelor cooking – cooking with bacon. Bacon. You know there is a God because He made possible bacon and beer. This is undeniable. If you do deny this truth then you are a denier which then obviously means that you are a Nazi. Is logical. 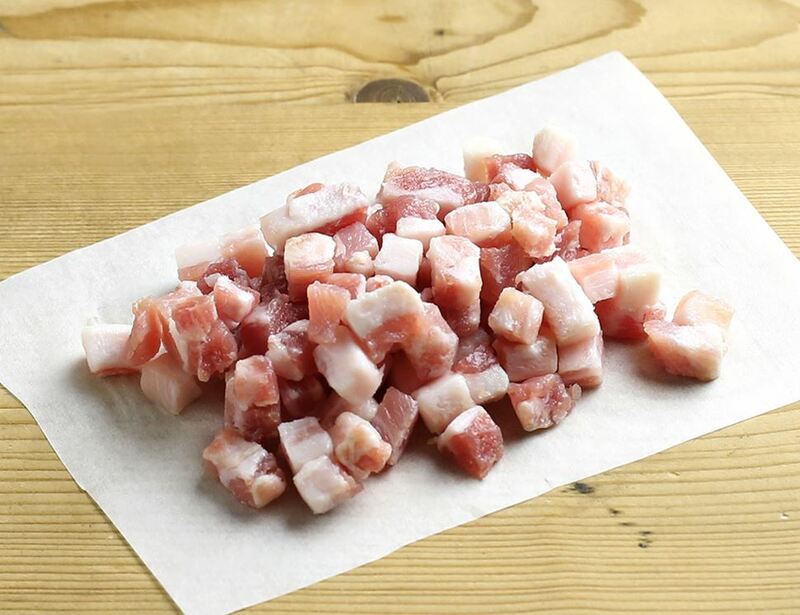 Pancetta in a block version that is ready to cut into cubes like this is one of the staples that I keep in the fridge. It lasts for around three weeks in whole form. I usually have a few hundred grams available at all times, if not more. It is a staple in many simple and quick dishes such as pastas and soups, as well as a base preparation for stews and other slow cooked dishes. Today I made my first attempt at a Dutch winter dish known as Stamppot. And guess what it has as a base? Cubed bacon. The secret to cubed bacon is how you utilise it and what you cook it in. I either use butter or lard, both of which are high in saturated fats and are thus good for you. Sometimes I use olive oil, (always extra virgin), if the recipe really calls for it. Melt a decent chunk of butter in a cast iron pot. Throw in your cubed bacon and toss around for a few minutes until it is lightly browned. Then remove it from the pan with a slotted spoon. You want to leave as much of the butter/bacon fat in the pan as possible. That stuff is what is known as taste sensation. Now I will take a brown or white onion that I have already halved and thinly sliced. Throw into the pan – make sure the pan and cooking fats are hot when you do this. You always want the pan to be hot when you add onion. You want it to immediately sizzle. Immediately after this turn the stove right down to as low as it will go and simmer the onion in the fat, moving it around from time to time, for about 10 minutes. The onion will immediately go brown from all the lovely fat juices. Did I tell you that this was a taste sensation? Examine the recipe that I linked to. It basically instructs you to do this although the writer was in the mindset of 7 years ago when saturated fats were still thought of as evil incarnate. What to do next with this onion? Slice up some nice ham and add it to the onion, stir this for a minute or so over medium heat then return the cubed bacon to the pan. Another minute then turn up the heat and add a good splash of white wine. make sure the pan goes woosh. Add some chopped oregano, some dried chilli, salt and pepper, and half a tin of diced tomatoes. Stir this around and let cook for about ten minutes while you bring some water to the boil in a large pan. When the water has boiled, cover the sauce and turn off the heat. Let it sit there for a bit while you cook your pasta. Add the cooked and drained pasta straight into the pan holding the sauce and toss with a good wedge of butter. Serve immediately. Cooking with cubed bacon is the basis of so many great recipes. Make it a staple in your bachelor fridge. Australia is more “grown up” than any other nation in the world. It’s time to get our womenfolk in order. Welcome in The Netherlands, home of the spekjes. Lardons in French. I use a lot of them. Where my wife is from they have a meat called Tasso – smoked ham, basically. Adds the same flavor bomb without the grease. Pancetta is a bit more expensive than bacon. It’s easier here to get thick cut, or uncut bacon for the same purpose. BTW I tried that potato dish on your last installment of bachelor cooking. I kind of did it on a whim on new year’s since I, an accomplished cook, happen to have a gallon or so of chicken stock, potato, onion, and parsley lying around. It was quite good, easy, and a big hit. I’d be tempted next time to add in tarragon or rosemary, but that’s me. We save every drop of bacon fat for cooking. Meat is in general so lean as to resemble shoe leather.